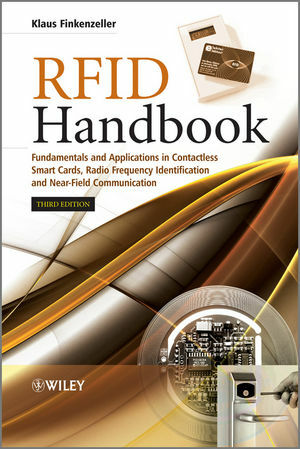 This is the third revised edition of the established and trusted RFID Handbook; the most comprehensive introduction to radio frequency identification (RFID) available. This essential new edition contains information on electronic product code (EPC) and the EPC global network, and explains near-field communication (NFC) in depth. It includes revisions on chapters devoted to the physical principles of RFID systems and microprocessors, and supplies up-to-date details on relevant standards and regulations. frequency ranges and radio licensing regulations. The text explores schematic circuits of simple transponders and readers, and includes new material on active and passive transponders, ISO/IEC 18000 family, ISO/IEC 15691 and 15692. It also describes the technical limits of RFID systems. A unique resource offering a complete overview of the large and varied world of RFID, Klaus Finkenzeller’s volume is useful for end-users of the technology as well as practitioners in auto ID and IT designers of RFID products. Computer and electronics engineers in security system development, microchip designers, and materials handling specialists benefit from this book, as do automation, industrial and transport engineers. Clear and thorough explanations also make this an excellent introduction to the topic for graduate level students in electronics and industrial engineering design. Klaus Finkenzeller was awarded the Fraunhofer-Smart Card Prize 2008 for the second edition of this publication, which was celebrated for being an outstanding contribution to the smart card field.